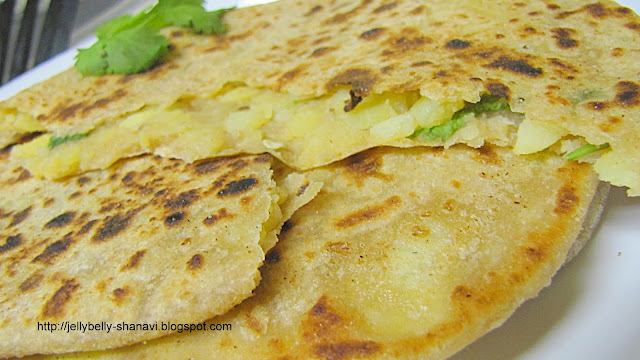 I made this paratha long back but totally forgot to post then. Am sure there are lot many ways to make stuffing as per taste , I find easy with the regular stuffing as i din't hv much time that day. U may also green peas in ur stuffing.It's totally ur choice. Njoy !!! Take a mixing bowl and add the flour ,ghee (melt the ghee b4 u add it ) and mix it well. Add the salt as well and mix. Add the warm water little by little and make a soft dough but not sticky. Rest the dough for 10 minutes after covering it. By the time, make the stuffing. Boil the potatoes for 10 minutes and let it cool. Peel the skin and mash the potatoes. Add salt,red chilli powder,coriander leaves,ajwain ,garam masala,green chilli, and mix everything well together using a spatula and divide them into equal balls. Looks delicious n perfectly made..
Those are some perfect looking aloo parathas , Shanavi..Way to go girl!!! 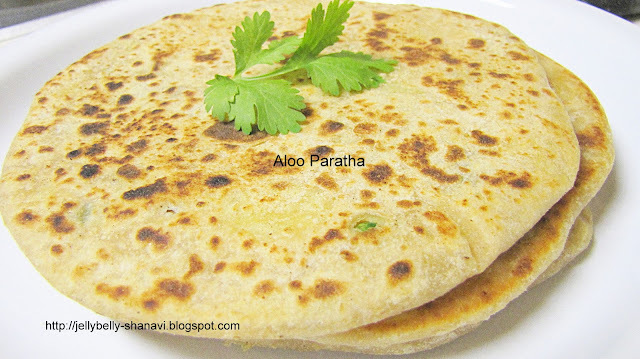 wow...perfect parathas...very nicely done...mouth watering here...yum!